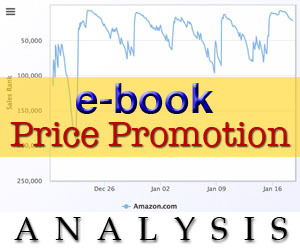 The e-book price promotion is of the most powerful marketing tools available to modern authors. Indie authors have known this for a long time, and many have used price promotion to reach the top of category bestseller lists. Short term e-book promotions work for traditionally published books as well, with the caveat that the publisher (not the author) dictates whether or not an e-book goes on sale, and for how long. About a month ago, I had the opportunity to see the impact of e-book price promotions firsthand, when HarperCollins put The Rogue Retrieval on sale for $0.99. The promotional price was in effect for about three weeks, during which my publisher and I promoted it across numerous e-mail and social channels. In this post, I’ll share my experience with each of them. My e-book went on sale on December 19th, 2016, dropping from $3.99 to $0.99. I had no advance warning of this promotion, though my agent had certainly been trying to get us one. I only noticed because I monitor my book’s Amazon.com page almost daily. A quick e-mail exchange between me, my agent, and my editor verified that this wasn’t an accident: the promotional price would be in effect until January 16th. Engage several e-book discount promotion services, to complement whatever HarperCollins might do. Schedule promotions far enough apart that I could assess their individual performance. Because I won’t get the actual sales numbers for a couple of months, I used my e-book’s rank in the Paid Kindle Store as a measure of performance. 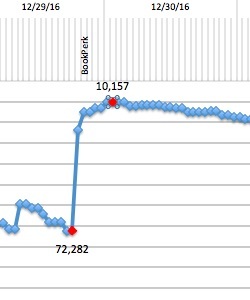 Two free services, NovelRank and the KindleNationDaily Ebook Tracker, helped me track my book’s rank on an hourly basis. Sales were inferred using the KindlePreneur rank-to-sales calculator by Dave Chasson. The obvious caveat is that this experiment only captures e-book sales on Amazon, not on other retailers like Apple iBooks and Google Play. However, given that most e-book sales happen on Amazon, and most of the promotion services are geared at it, I think Bestsellers Rank is a reasonable proxy. Just after midnight on the 19th, my rank was 461,116 in the Paid Kindle store, which corresponds to less than a book a day. My previous experiment with Amazon Sales Rank suggests that there’s a lag time of around 12 hours between a sale and the corresponding change in rank. I account for this lag time in all of my analyses. Interestingly, my book’s rank shot up to 100k about 12 hours after the price change, and through other jumps reached 56,451 by 11 p.m. on the 19th. 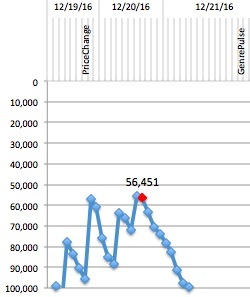 That suggests ~5 sales driven by the price change alone on the first day, likely due to e-book price monitoring services that notify readers of new discounts. A number of paid services help authors (and publishers) promote discounted e-book titles. BookBub is arguably the largest and best-known of these. It’s also one of the most expensive, though my previous analysis of BookBub’s numbers shows that the investment usually pays off. Unfortunately, BookBub ads are very tough to get: their rejection rate is 80-90% by some estimates. Traditionally published books don’t seem to have a competitive advantage with BookBub, by the way. Publishers nominate a bunch of their titles, and BookBub gets to choose. I can’t say whether or not The Rogue Retrieval was nominated, but it was not selected. Based on author recommendations, Kboards feedback, and my own research, I booked a number of other services. BargainBooksy ($40), which had 111,900 subscribers on its Fantasy/Paranormal list. Riffle ($30), which is a BookBub-like service that’s been around a while. BookSends ($25), which has 26,000 e-mail subscribers in the Fantasy category. GenrePulse ($17), which claims 3,000-12,000 e-mail subscribers depending on the genre. ManyBooks ($19), which claims 130,000 subscribers across all genres. BKnights on Fiverr ($10), a low-cost service claiming 4,800 active readers. I also considered BookGorilla, Book Barbarian, Robin Reads, and The Fussy Librarian, but these were already booked for the duration of my promotion. There were also some services I declined to use due to price (BookGoodies, KindleNationDaily, BooksButterfly), lackluster performance of current promotions, (BookTastic, EbookSoda), or just a bad vibe (Books and the Bear, Hot Zippy). GenrePulse seemed like a great partner. They offered targeted promotion to 3,000-12,000 e-mail subscribers depending on the genre, and included bit.ly links to track the number of “clicks” your campaign received. They were also the most accessible; I was able to book the sci-fi list just a few days out for $17. Unfortunately, my book only got about 30 clicks, which was abysmal performance compared to the other handful of books promoted that day. I wrote to the company to ask about this, thinking there might have been a technical problem. To their credit, they offered to run the campaign again for free, any day of my choice. I requested January 4th, the e-mail went out… and got 28 clicks. I’m not sure why, but in spite of their great service and low cost, this service gave me poor results. Next up was BookSends, which yielded more promising results. I was able to book a promotion just a few days in advance for the Fantasy category (26,000 e-mail subscribers). The e-mail went out on December 22nd; my copy came in at 3 p.m. and looked good, with my book placed above the fold. 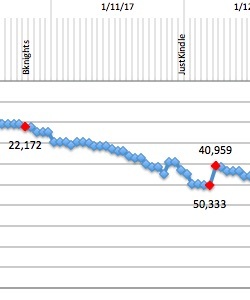 On the night of December 21st, my book’s sales rank had fallen to around 191,000, selling less than a book a day. 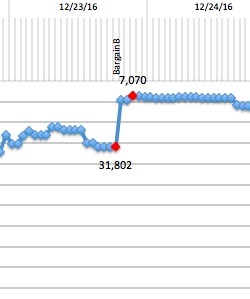 BookSends shot it up to 31,913 almost immediately, and eventually climbed to 23,540. I estimate I sold around 15 books, a pretty good result. BargainBooksy (also called FreeBooksy for the e-book giveaway side of the business) is a well-known promotion service. The maturity of their business was immediately apparent from the detailed information available to authors, including a per-genre subscriber count and price for e-book promotions. A promotion on the Fantasy / Paranormal list costs $40 to reach 111,900 subscribers, making this one of the most expensive and widest-reaching promotions I tried. 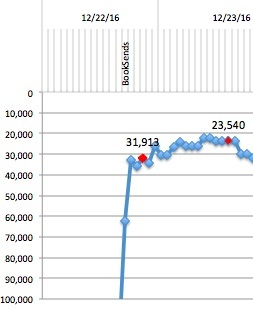 The timing was good, too: it ran on 12/23, when my book already ranked at 31,802 from the BookSends promotion. By 9:45 p.m. on 12/23, BargainBooksy sent my book up to #7,070 in the Paid Kindle Store, the highest rank it achieved during the price promotion. That put it in the top 50 for two of its subcategories, which hopefully allowed Amazon browser to find it. The book stayed under 10,000 for almost 18 hours. One advantage to being a HarperCollins author is the possibility of getting into BookPerk, the publisher’s daily e-mail to (allegedly) almost 1 million readers. Even though it’s not genre-specific, the low price coupled with the wide distribution could make a significant impact. Plus, I read my BookPerk e-mail every day and really enjoy it. Several Harper Voyager authors have gotten into BookPerk during a price promotion. Sometimes they get advance notice, other times not. My editor didn’t mention it, so I figured I wasn’t getting in. Thus, it was a pleasant surprise when I opened my BookPerk on December 29th and saw my book in there. The result was impressive and immediate: my book went from 72,282 to 10,157 in the Paid Kindle Store, and top 50 in two subcatgories. I realize this isn’t accessible to most people, but I include it for the sake of completeness. The next promotion came about in an unusual manner. A woman named Lisa reached out to me after seeing my promotion on BookSends, and offered a discount on a ManyBooks promotion (normally $25). This is a clever way to drum up business in a competitive industry, but it also sounded some warning bells. Most legitimate promotion sites have plenty of applicants to choose from. The fact that someone took the time to look me up and send a message meant they were new and/or desperate. We only recently introduced genre preferences to our readers so unfortunately, I don’t have any stats as of yet. My apologies. To clarify: would my book only be sent to members who prefer its genre, or to all recipients? Your book would be sent to all recipients, but our readers’ preferred genres will be featured at the top of the newsletter. It wasn’t ideal, but it was a reasonable answer. I figured that a total scammer wouldn’t spend this much time replying for $19. I applied for a range of dates and got January 3rd, right after the New Year, when I planned to push the promotion on my own channels. 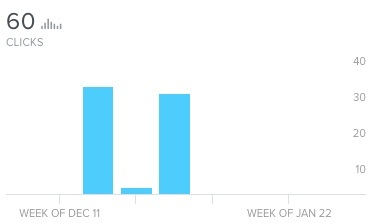 I started my own e-mail and social media push on January 2nd, and got a decent response… probably 8-10 books sold. Due to the proximity, it’s very possible that ManyBooks did nothing, and the sales all came from my own followers. 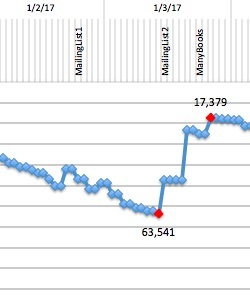 However, based on the timing, ManyBooks moved the needle a tad, from 25,319 to 17,379 in the Kindle Store. Probably about two books sold. Thus, I’m not ready to recommend ManyBooks, at least until their service matures a little and can provide better targeted marketing. I hadn’t been looking at this promotion service, but my editor mentioned it. Granted, this was in the context of services my publisher was not booking for me, but still, it was on his radar. Riffle has been around for a while, and the reviews of it I could find were somewhat mixed. The list price for an ad was $50, which seemed high. Here’s where the Kboards forums came in handy. Several authors remarked that they’d asked for (and received) a promotional price of $25-30. So I booked an ad, and when the invoice came, I replied and said that some of my friends on Kboards had gotten a promo price of $30; could I get that courtesy as well? They agreed, so I booked the ad for January 9th. I got another surprise boost the day before Riffle was set to run, when my publisher shared the promotion price on their Facebook and Twitter channels. 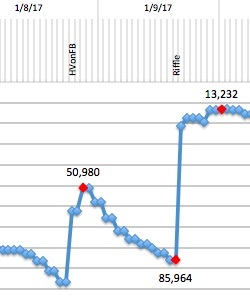 Then Riffle ran, and pushed me from 85,964 in the Paid Kindle Store to 13,232. Thus, for me at least, Riffle seemed to move some books. I engaged a couple of other services that had been mentioned by other authors. It’s hard not to hear about BKnights, the book promoter guy who hires out on Fiverr. I opted for the $10 service, which includes an e-mail out to the guy’s followers. Social media is fine and good, but e-mail marketing is what sells. Even with that upgrade, I’m afraid that BKnights did absolutely nothing for my book. 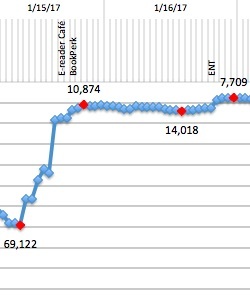 In fact, the sales rank went steadily down after my promotion. JustKindleEbooks offers a “premium” promotional service for $30 to have your book promotion sent to their e-mail list. 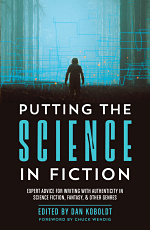 For another $3, you can have your book featured in the sidebar for a week. Although I couldn’t find many author reviews on this service, when I looked at some of the titles they were pushing, they were selling rather well. This does not mean that JustKindleEbooks can take all of the credit, but it was better than seeing them push books that weren’t selling at all. I booked their services for January 11th. E-reader Cafe offers a few promotional packages, but the one that made the most sense for me was “Deal of the Day” for Fantasy, which got my book out to their website, social media, and e-mail channels. I booked that for January 15th, right toward the end of my promotion. At around the same time, I also got into BookPerk again, an unexpected delight. Their combined effect took my book from 69,122 in the Paid Kindle Store to 10,874, and it largely stuck at that rank until the next day, when my last promotion hit. ENT is arguably the top go-to promotion site after BookBub, at least among the indie authors I follow. Like BookBub, they’re also selective about the books they take on. My first request, for early January, was declined. My second request was also declined. I suspect this was largely due to ad space, not an issue with my book. My third request, which allowed the latest and widest range of days for my ad to run, was eventually selected for the last day of my price promotion. Coming off the strong sales from the E-reader Cafe feature, ENT still made a visible impact, driving the Sales Rank from 14,018 to 7,709. It’s not hard to see why; the promotional e-mail looked fantastic. I’d absolutely book both “E-reader” promos again. Overall, the price promotion for The Rogue Retrieval was an enjoyable experiment. It let me test out various e-book promotion services, and made my book accessible to more readers. All told, I estimate that it sold around 250 copies during the discounted period. 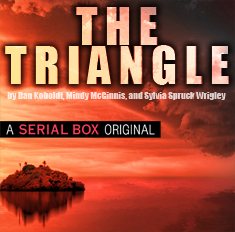 That’s pretty good for a new author, and it sets the stage for another price promotion to coincide with the April release of book 2, The Island Deception. Please keep in mind that this was just the experience of one author with one book. If you’ve used any of these services and had similar (or different) results, please share in the comments below! Note: You can find more book promotion articles/resources at my book marketing & promotion page. Excellent analysis. Thanks for posting these resources; as a reader, I always wondered what impact the price discount had. Cheers!